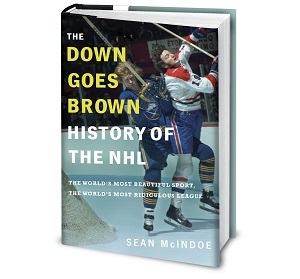 Down Goes Brown: What do the Washington Capitals do now? Heading into last night, it felt like something might have finally changed for the Washington Capitals. After three decades of increasingly devastating playoff debacles, this time felt like it might be different. After falling behind 3–1 in their series with the Penguins, they’d fought back to force a seventh game. You could feel the narrative rewriting itself — the notorious choke artists were finally going to flip the script on their arch-rival, the sort of dramatic turnaround that sends a franchise on the way to its first championship. And then it all happened again. Last night’s 2–0 loss didn’t just end the Capitals’ season. It was the worst-case scenario — one that saw yet another promising Washington season end with a whimper. It wasn’t their best game. It wasn’t even close. And they know it. Lots of anger in #Caps room, they said they didn't leave it all in the ice, the effort wasn't there. Last year was sadness, this yr anger. And now they’re left wondering what’s next. How do you fix this? Can you fix this? This the part where I’m supposed to lay out what the Capitals’ ideal off-season plan should be. But here’s the thing: I’m not sure there is one. There are several different routes the Caps could go here, and each one has some serious flaws. The approach: Sometimes when you're holding a losing hand, the smart thing to do is to keep playing until your luck turns around. And sometimes, the right move is to fold your cards, walk away from the table and cut your losses. The Alex Ovechkin-era Capitals have been trying to win a Cup for a dozen years now, and the core of this year's edition has been together for the last five. That's a long time in the salary-cap world. The list of NHL teams that have been contenders that long without ever getting close, only to finally break through years down the line, is an awfully short one. It might even be empty. Something's rotten in the foundation. Bulldoze the whole thing and rebuild. The problem: Let's start with the obvious: This is a really good team. They've put up 238 points over the last two seasons, which is ridiculous in the NHL's age of parity. So why haven't they won a championship? Well, as unsatisfying as the answer might be, maybe they're just unlucky. The league's playoff format means they have to get past a tough Penguins team to escape the second round, and they've come within a bounce or two of doing it. An 82-game season should tell us a lot more than a seven-game series, and in the Capitals' case, it's telling us that this is an excellent team. Blowing them up because they lost a Game 7 seems foolish. But let's say you don't buy any of that, and you really think this team needs to start over. How do you do it? The team's four highest-paid players in terms of cap hit are all signed through at least 2020, and as you may have heard, trading big contracts isn't easy these days. You can let UFAs like Karl Azner or T.J. Oshie walk, but breaking up the core might be just about impossible. And if you do manage to trade some of your bigger names, you won't be getting anywhere near fair value. The approach: OK, so making a bunch of trades will be tough. So instead, make one. There's no bigger move the Capitals could make, and no cleaner break from the identity they've built, than pulling the trigger on an Ovechkin deal. It's been called "unthinkable", and yet you can bet a lot of Capitals fans are thinking it right now. Ovechkin is a great player who'll be an easy Hall of Fame pick some day. Heck, he might go down in history as the greatest goal-scorer of all-time. But between the playoffs and the Olympics, he's come up small when his team needed him most time and again. At some point, that becomes a pattern. And with four years left on his deal, there's only one realistic way for Washington to break out of it. The problem: Like with the point above, we could wonder whether this sort of move wouldn't be a massive overreaction to a small-sample-size problem. In a league where goals are hard to come by, parting with a guy who produces more of them than any other player seems like a strange choice. But again, let's ignore that and assume the Caps do decide that they want to move on from their franchise player. Who are you trading him to? Ovechkin will be 32 by opening night and carries the fourth-highest cap hit in the league. Not many teams could trade for him even if they wanted to. Granted, we could have said similar things this time last year about someone like Shea Weber, and we know how that worked out. We've seen some big one-for-one deals in recent years, so maybe some other team that wants a big shakeup would be willing to roll the dice. But it seems extremely unlikely, and again, that's ignoring the fact that it doesn't necessarily seem like a great idea.